Special Containment Procedures: SCP-1998 is to be contained in a High Value Storage Locker in Site 38. Testing of SCP-1998's effects are to be carried out only according to the following protocols. First, a request is to be filed with the Foundation Ethics Committee, which will provide both the appropriate D-class personnel and the parameters under which experimentation can be carried out. Second, all aspects of every experiment are to be monitored in person by one representative of the Ethics Committee and broadcast live via closed-circuit camera to the remainder of the Committee. Third, under no circumstances is SCP-1998 to be used for anything other than experimental testing; any attempt to use SCP-1998 to alter the free will of D-class personnel for the benefit of either individual members or departments of the Foundation will be considered grounds for immediate demotion and reassignment. Description: SCP-1998 is a pistol of unknown make or manufacture. 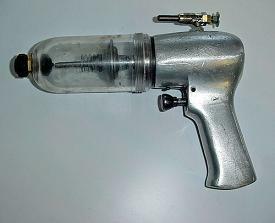 The pistol is operated through use of a plunger-shaped apparatus directly beneath the barrel. SCP-1998 does not use any sort of ammunition, instead firing an energy pulse via unknown mechanisms. The power source of SCP-1998 has never been determined; it does not require access to any external source of power, though it does require approximately five minutes between uses, presumably for cooldown or recharging purposes. The energy pulses generated by SCP-1998 have no effect on inorganic, inanimate, or non-human materials, dissipating on contact with anything other than a human body or clothing directly in contact with a human body. Pulses will dissipate after traveling approximately twenty meters. The energy pulses produced by SCP-1998 have their principal effect on the human brain, specifically the motor cortex, primary auditory cortex, and hippocampus; these areas are affected regardless of what part of the body is impacted by the pulse. Individuals affected by SCP-1998 pulses will experience three effects in rapid succession. First, affected individuals will turn towards the operator of SCP-1998 and sit on the ground in front of them. The placement of obstacles in the path of this movement may result in destabilization or loss of balance; once the individual is no longer standing and is facing the device's operator, movement will cease regardless of the physical comfort of the position. Second, affected individuals will experience functional paralysis, having no voluntary control over any motor function other than what movements are required to maintain eye contact with SCP-1998's operator. Finally, affected individuals will listen closely to and deeply internalize whatever SCP-1998's operator says during the period of paralysis; any information conveyed during this period will be remembered perfectly and completely for the remainder of the individual's life, and any imperative commands given will be carried out as completely as possible after the end of the paralysis.1 This period will continue for approximately nineteen minutes, after which affected individuals will regain motor control. The tendency of individuals affected by SCP-1998 to enter periods of sustained shock and psychological trauma are believed to be related to the immense, traumatic physical pain (described by two affected individuals as "agonizing" and "hellish") caused by exposure to SCP-1998. ENJOY THIS FREE SAMPLE FROM GIMNASION SUPPLY! CONSIDER US FOR YOUR LEARNING ENHANCEMENT NEEDS IN THE FUTURE! 1. Experimentation has determined that individuals given physically impossible orders (demands that violate laws of physics) will lead to affected individuals carrying on without obeying the order, but report feelings of regret and low self-esteem due to their perceived "failure." Individuals ordered to perform tasks that lead to physical discomfort or danger will carry out the order regardless of the potential harm, and will often shrug off attempts to treat wounds incurred during such tasks.